‘Rule of law’ is a term used by people across the political spectrum in Hong Kong, who attach very different meanings to it. Some believe it means following rules, others that no one is above the law. Even lawyers can struggle with the concept, as Mr Benny Tai Yiu-ting, Associate Professor of Law and an expert on the rule of law, can relate. “They may have some ideas about what it means but not have the kind of understanding to be able to put it in a structural framework and explain it to other people,” he said. At the urging of a lawyer friend, Mr Tai decided to do something about this deficiency. 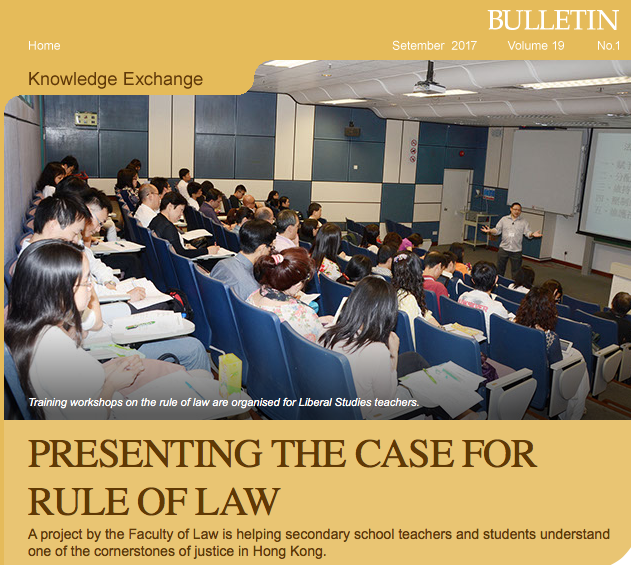 In 2012 he launched the Rule of Law Education (ROLE) project, in which Faculty staff and HKU law students go into secondary schools to help raise awareness. This conception is conveyed through workshops, teaching kits and lessons taught by HKU students – many of them future lawyers – who not only instruct senior secondary school students but also strengthen their own understanding and ability to explain the concepts. They also receive teaching training... Click here to read the full article. To visit the ROLE website, click here.